This post is a documentation of our experience on BetaList. It features a case study, some tips, and will give you an outlook of what to expect when submitting your startup to BetaList. Established in 2007, BetaList is arguably the most popular beta directory. It is known for helping new tech startups recruit users, gain initial publicity and traction, and get off the ground. We submitted our startup to their directory around mid December, and I can assure you, it did not disappoint. After submitting our application, we were approved and listed in a little over three weeks. The process is not time-consuming and surprisingly very simple--just make sure you take a look through their submission criteria and ensure you’re compliant with their regulations prior to submitting your application. During the first day of being posted, surprisingly, we did not receive the majority of our traffic. 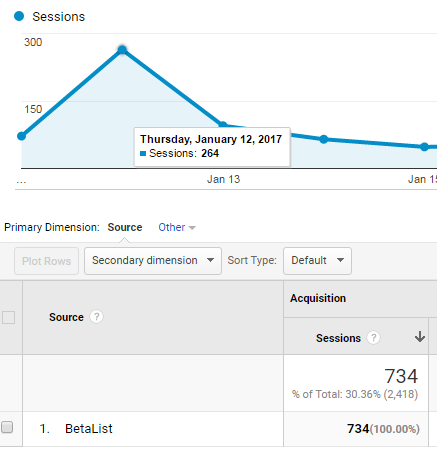 Only only 72 visitors were referred from BetaList. So don’t be alarmed if you’re not pulling in the traffic you expect on the first day. On the second day, we received about 264--which was our best day. And on the third, traffic was still trickling but it was a Friday, so visits were foreseeably lower. 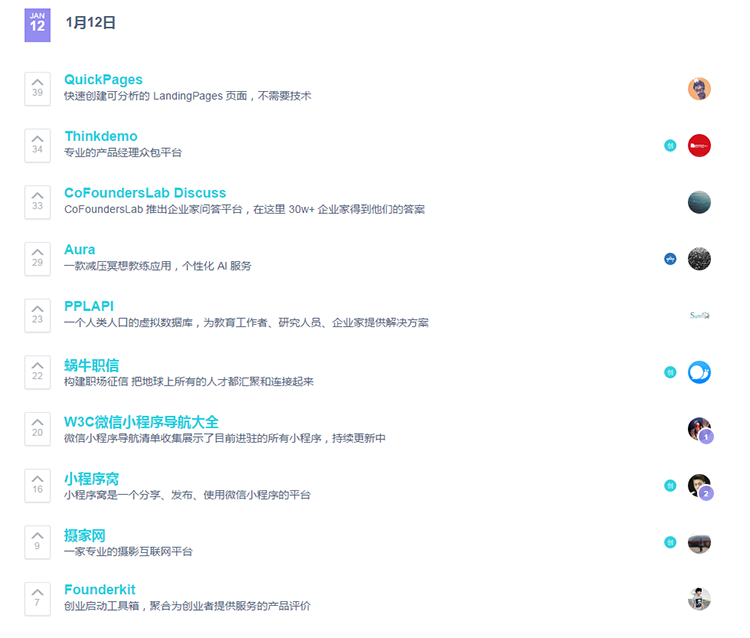 However, we did manage to get featured in the ‘trending’ section (appears at the top of BetaList; includes startups that were recently listed and were not ) which pulled in some visitors for us. We had 95 visitors that day. From that point on, traffic still steadily came along for a little while, slowly dying down over the next weeks. 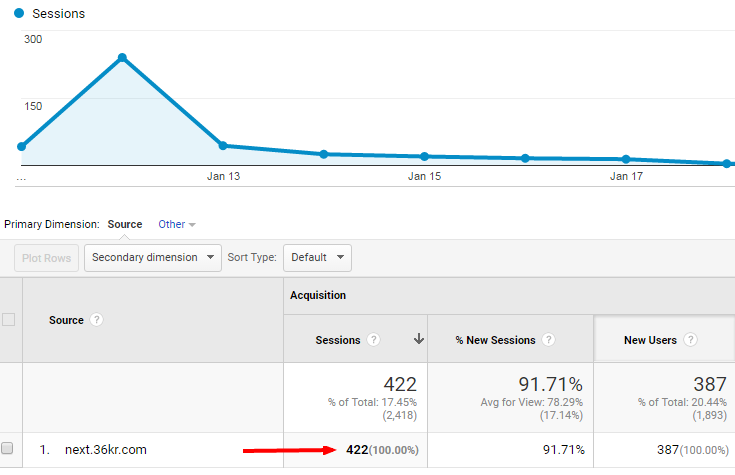 All together, we received 734 visitors from BetaList (they are still coming in to this day… but only about 2-10 visitors per day). 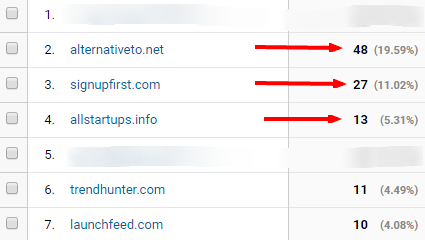 What’s so great about BetaList is not just the sheer amount of users you get, but also the exposure to other promoters (bloggers, directory owners, journalists, etc.). The 700+ users that were sent to the site were great. However, being featured on BetaList was more than that. We also got discovered by a few other promoters that featured us on their website. One of the places we would have never thought to promote ourselves is a Chinese website (which I can hardly understand even with Google translate activated) called 36kr.com. Within the website, they have a directory, similar to ProductHunt, which you can access here: http://next.36kr.com/posts. Remarkably, we were ranked #1 for the day and received over 400 users through that websites. Although the website was entirely foreign, it is clear that it did not deter their visitors from using our software. They seemed to like it. If you’re not featured on there after submitting your startup to BetaList, I would highly recommend you personally submit your startup there. There are many avid techies on that website who are likely willing to use services your startup offers. Apart from that directory, we were contacted by quite a few people asking us if it’s okay to post about QuickPages on their blog/website. It’s clear that all kinds of interests follow BetaList to find newly formed startups (not just beta testers). Try to get as many likes on their tweet as possible (this will make you stand out). Share your BetaList listing with your followers and current users, but don’t ask them to like the listing (it’s against their terms). Retweet their tweet (this will help you with the last point by alerting your followers). The whole point is to be as socially attractive as possible (the more likes you get, the more attention it will draw because people focus on things that are useful for other people) and get featured in their ‘trending’ section [if your startup gets a decent amount of likes (compared with the other startups the same week), then you’ll get be displayed in the trending section, which will drive more views to your listing]. Overall, we submitted to over 30 beta and startup directories. Obviously, not all were equally as successful, however there were some noteworthy ones that I personally believe are worth the time it takes to submit it. Although you may not get a lot of visitors from the directories listed below, it may be worth it in the long run because if you even receive an average of 10 visitors per directory, you can get 300 new people to your site by submitting to 30 more directories. After all, it takes just a few minutes to fill out a form. And most of them are very similar. However, that is certainly not necessary; it should only be done if you want to maximize without paying fees for better promotional opportunities.